It's time for me to start mentally planning this year's edible garden. I took a moment yesterday to map out a garden plan for our backyard. 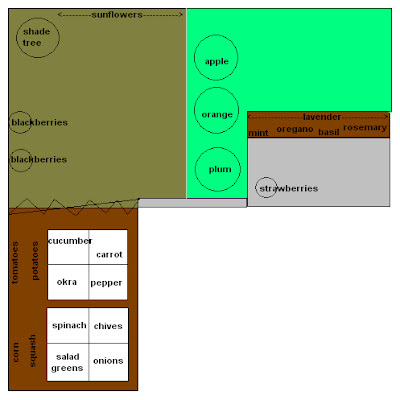 It's not properly scaled and doesn't include the right half of our yard which is just a lot of grass, but it's helped me visualize where all the food is going to go. The tan area is all mulched. We'd like to leave it as open as possible as a space for the kids to run, so we're just tucking some blackberry bushes along the side. I'm hoping the shade tree and fruit trees will help lend the area a bit of shade, as it receives full sun almost all day long. The dark brown on the bottom left is our side yard, where the vegetables will go. The area is surrounded on three sides by cinderblock walls and our house. The entrance will be fenced off with a picket fence (if we ever get around to putting the darned thing up.) Hopefully, that will help deter the quail and rabbits from snacking too earnestly. We'll probably have to tie some ribbons and foil onto it as well, and maybe even back it with net. The two white squares are our raised beds. They have screened covers, which I can close during the hottest parts of the day (it's not easy getting things to grow in our scorching desert sun) and overnight to keep the neighbor's blasted cat out of them (meanest cat you'll ever meet). The herb garden will be in the little bed running the length of our patio. This'll make it easier to pop out for a cutting whenever I need one. We're going with just our 5 favorite herbs this year, focusing on quantity over variety. I hope to have enough lavender to dry for tea to get me through the winter. Our back fence is chain link and looks out onto a small horse pasture. I don't want to cover it entirely, as we love to interact with the horses (they come right up to the fence to eat apples from our hands), but I want to provide a bit more privacy from the road to the left, so we're adding sunflowers to the honeysuckle and jasmine already planted along that portion of the fence. It's a trick finding plants that will grow nice and tall without enticing the horses to nibble too much. Fortunately, sunflowers are cheap and hardy (just like me - ba-dum-bump! ), so we can afford to lose them if the horses need a snack. Have you begun planning your spring garden yet? Anything you're particularly excited about? I'm most eager for the blackberry bushes. I hope they thrive. Mmm, I love blackberries. Daniel has had some experience with blackberries. Don't expect them to produce many berries the first year. They yield next year on the canes that grow this year.It takes at least 2 years to get them established. Fortunately they are worth the wait. That's a valuable piece of information, there. Thanks! Oh, thanks for that, Sophie! Companion planting is actually something I try to take into account, so I'm glad you mentioned that. Our tomatoes are out favorite vegetable crop, so I'll definitely want to move them. Perhaps against the picket fence, so I can stake them directly to it.